I’ve worked in customer service a long long time. Tired of being nice, of smiling and nodding, of caring about everyone’s problem before caring about my own. Years ago I worked with a really good friend at a call center and she said that there was drama every day at a call center, so all call centers were dromedaries. 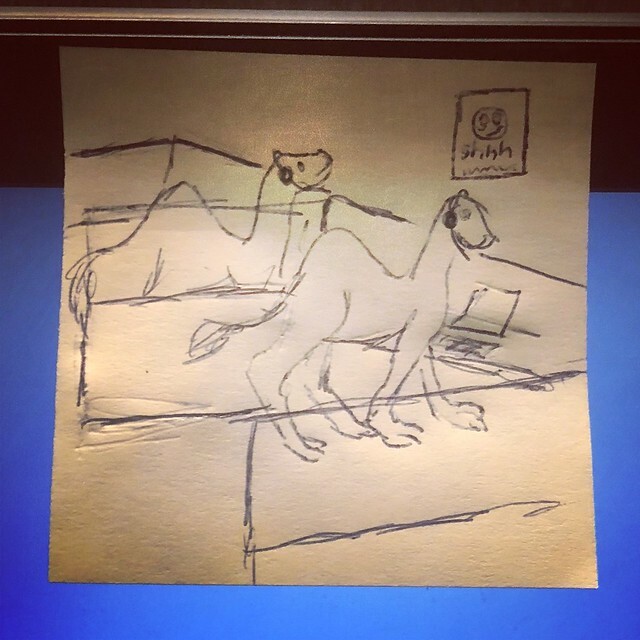 Another good friend that works where I am now, in another call center, drew me some cubicle camels for me to enjoy. It makes me very happy to have fun and silly people in my life and at my workplace. It makes me very happy to be able to help people. It makes me very happy to be doing something now that is paying me well enough that I can pay 65% of my bills without any panic. I’m tired and unsure and unclear what I need to do next, if anything. Maybe this is it. Maybe my legacy for the world is just training and monitoring quality and nothing else. I mean, I am aware that my wonderful son is my real legacy in the whole something is living on beyond my death kind of way. My son is amazing, but a lot of what is great about him comes from him and some from his father. But, sometimes, I wonder if I can do something that only I can take credit for and have people continue to care about what I’ve created after I’m dead and gone. I want the whole idea of a simple life to be enough, and that the simple life I’ve led can be enough for me. This entry was posted in Gadding and tagged aging, camel, creating, customer service, doubt, drama, dromedary, fear, legacy. Bookmark the permalink.